To determine if you have a 2 Inch backset, measure from the edge of the door to the center of your bore hole. See graphic on the left. 2 Inch backsets are very rare so there are not many options available. 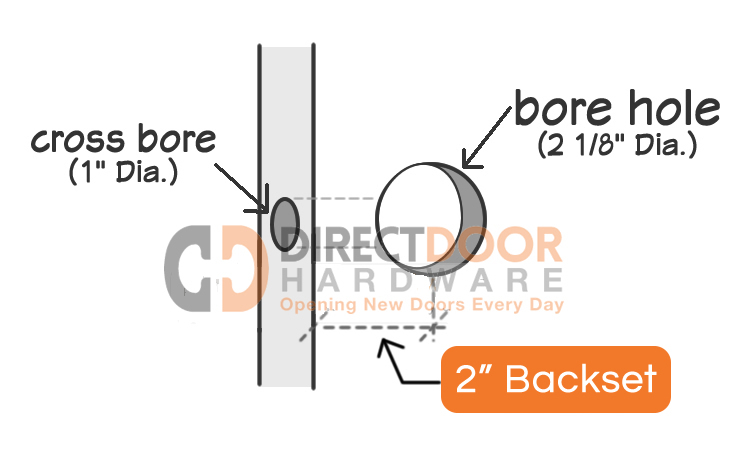 See deadbolt and knob options below. Multiple Finishes Available for Deadbolts, Knobs and Levers. Select item to see available options. No Keyed Knobs for 2 Inch Backset? Sorry, we do not have any keyed locks available with a 2 Inch backset. If you need a keyed lock, you'll need to order a single cylinder deadbolt to be used in conjunction with a passage function knob. You will need two bore holes for this set-up. 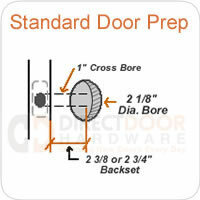 It is actually very common to use a single cylinder deadbolt with a passage knob on exterior doors. You get the most security out of the deadbolt lock anyway.